Capturing images of your desktop sounds like it should be an easy task, but it practice it can be more difficult than you first imagined. Windows itself can be used to capture your desktop in its entirety or just a single window, but that is the extent of the options available to you. Using DuckLink Sreen Capture, these two options are still available, but so are other capturing modes. The program can also be used to capture just a region of your desktop – not necessarily an individual window – by simple drawing a selection rectangle around the areas you are interested in. If you want to capture an image of a web site, but the page content you are interested in does not fit onto a single page, you would ordinarily have to capture two or more screen grabs and stitch them together in an image editing program. With DuckLink Screen Capture, it is possible to capture tall or wide windows as a single image. 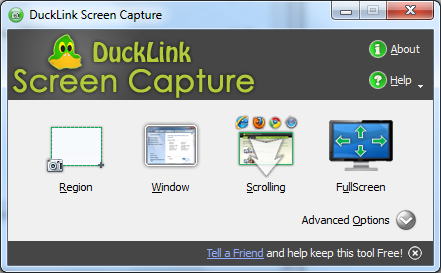 Other screen capture tools are available, but DuckLink Screen Capture is free of charge. It may not include all of the advanced features of some of the alternative programs, but all of the basics are covered, and the program functions well. - Added rich tools for fonts: family font, font size, color and so on. - Refined color selection window. - Use script to extend the functionalities after grab screen, provided the capability of customizing ui and adding new buttons. - Added one sample script which can share the captured images through http://min.us. A quick and easy way to capture a range of different desktop screenshots.